Peak Demand Inc | Why is the CT on my High Voltage Application Rated for 600V? “I am looking for CTs for a high voltage application and the one you recommended is rated for 600V. That doesn’t make sense.” I have heard this response from many customers and engineers both. Let’s explore this in a Peak Demand Knowledge Center article. Unlike a wound-type current transformer, a window CT is constructed in such a fashion that the voltage never actually touches the current transformer – the conductor passes through the “window” of the CT. 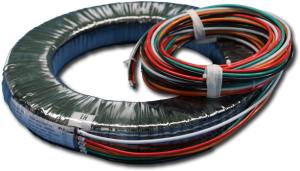 Many applications such as power transformers, switchgear and medium and high voltage breakers that need window CTs are rated much higher than 600V. However the bushing or conductor for many of these applications is already shielded for other purposes and provides the necessary material and air gap necessary for proper usage. As long as the line-line voltage being applied (if any) to a CT is less than 600V, than a window CT is indeed the proper choice of current transformer for that application.